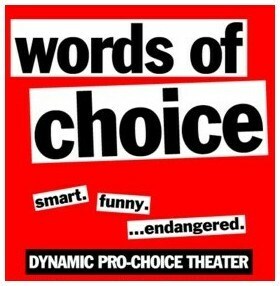 Women around the world are invited to watch two live-streamed performances of Words of Choice on the Internet and to participate in the post-show discussions of this dynamic pro-choice theatre piece via Twitter, Facebook, instant messaging, and shared photos. Words of Choice will be performed at The Secret Theatre in Long Island City, New York on Friday, March 1 at 7 pm EST and Saturday, March 2 at 3 pm EST. As part of the first-ever WiredArts Fest, the performances will be available to anyone with Internet access and will be shared with hundreds of reproductive rights and social justice activists. pieces. Each performance will be followed by a panel discussion. Friday night will feature Amanda Marcotte, who is the author of It’s A Jungle Out There: The Feminist Survival Guide and a regular contributor at Pandagon and RHReality Check, and Lori Adelman, contributing editor at Feministing. Saturday afternoon’s discussion will be led by Lynn Roberts, a founding board member of SisterSong Women of Color Reproductive Justice Collective and an assistant professor at School of Public Health at Hunter College. Host a Viewing Party! Start a dialogue with your friends about reproductive rights by hosting a viewing party to watch the play. Words of Choice has prepared an excellent Viewing Party Kit that you can download here and a Free Original Poster that you can download as a pdf. There are also Free Itunes and Android Apps to let you participate in the event. Read more here. Watch Online: You can watch online anywhere for free through Virtual Arts TV. Free viewing comes with pop-up ads at any time. For a mini-payment of $2.50, you can watch online without the annoyance of commercials, and you are guaranteed a high quality stream. Buy Online Premium Live Streaming Tickets Here (Note: Saturday tickets include an additional play at 2 pm at no extra charge.) Here is a YouTube tutorial about the signing up for the premium WiredArtsFest LiveStream and using it. Suggestion: Set up your premium stream now, or at least a half hour in advance of the show. Watch at the Theatre: If you want to attend the performance at The Secret Theatre in New York, please visit their website. Tickets are $18 with discounts available for groups and pro-choice activists. The Words of Choice ensemble will include Crista Marie Jackson, Carl H. Jaynes and Claudia Schneider under the direction of Francesca Mantani Arkus; Kelly Vieau is stage manager; Stacey Linnartz is Artistic Consultant. This entry was posted in Arts & Politics, Arts & Social Justice, Theatre, Video on February 26, 2013 by Martha Richards.